In 1990, I was in Year 10 at high school and finally stopped buying Smash Hits magazine - probably because it started featuring Neighbours and Home And Away stars more frequently than music acts. Besides, between my regular excursions to import record stores, purchases of British magazines and, as I mentioned in Part 1, the arrival of American Top 40, my music information superhighway had plenty of traffic. Another great source of music for me was my new English penfriend, to whom I'd started writing in 1989. In 1990, I decided it would be a great idea for us to swap music, so instead of letters, we started sending parcels to each other, with every package containing a 7" single or cassingle. Problem was: by the time my request for a track (like 49ers' "Touch Me") reached my penfriend, the UK had already moved onto the next single (so I received 49ers' "Don't You Love Me" instead). She did, however, send me some things I never would have gotten a hold of in Australia and I, in return, sent her the likes of Dannii Minogue's original Australian single of "Love And Kisses". Number 75 "Feels Good" by Tony! Toni! Toné! 1993's "If I Had No Loot" was their big song in Australia, but American Top 40 introduced me to this US R&B group as this track climbed up to number 9 there. Among the band members (none of whom was called Tony) was Raphael Saadiq, who'd go on to form Lucy Pearl and become a Grammy-winning solo artist, songwriter and producer. It's a bold statement to claim a whole decade for yourself - and although the British artist (real name: Paul Walden) got off to a decent start with this saxaphone-featuring dance track, he didn't even dominate one year, let alone a whole decade. My aforementioned pen friend sent me the 7" single of follow-up "Whose Law (Is It Anyway? )", which was so awful I played it approximately twice - once to hear how awful it was and a second time to make sure. Guru Josh wasn't seen back in the UK top 10 until 2008 when Guru Josh Project took a remix of "Infinity" to number 3, two places higher than the original. In Australia, the 1990 original reached number 4. By 1990, I had become accustomed to scouring single sleeves for any reference to PWL, and so this single (co-written and produced by Phil Harding and Ian Curnow) quickly made it into my collection. I must have been about the only one, since it failed to register on the UK or Australian charts whatsoever. Finding info on Johnnie (or Jon Otis, as he sometimes went by) is not so easy - and he's not to be confused with the singer Johnny O, who does have a Wikipedia entry. He kicked off this top 100 with "My Kinda Girl" and this was another great song released by one half of the hottest production teams of the time. The title track to his breakthrough solo album, "Tender Lover" received a helping hand for the single release from another in-demand act, singer/rapper Bobby Brown, whose biggest hits had been produced by... LA Reid & Babyface. The LaFace team really were a sharing bunch, with Babyface guesting on singles by Karyn White and Pebbles in 1990 as well. Like fellow freestyle artists Stevie B and Timmy T, 1990 was a good year for Dino (real name: Dean Esposito). The difference was: Dino didn't resort to drippy ballads for his breakthrough singles, with 1989's "I Like It" and this track, which became his biggest hit, reaching the US top 10. It wasn't such a good year for Dino's hair, however, with his half-mullet, half-braids the definition of appalling. Like S'Express back in Part 1, the new decade wasn't so kind to Inner City, who'd helped take house music into the mainstream a couple of years earlier. After a string of five UK top 20 hits, this first single from Fire couldn't even make the top 40. It would be the first of a series of singles over the next few years that would place in the 40s and 50s, with the odd track faring slightly better. In 1990, this was the first song I'd heard by girl band Klymaxx, who at that stage only consisted of three members. Bigger in the '80s - both in terms of chart success and number of members - their most successful single was 1985's "quiet storm" ballad, "I Miss You". From the appropriately titled The Maxx Is Back, "Good Love" should have been a bigger hit, since it perfectly tapped into the pop/R&B sound of the time, but it wasn't to be. That would have been the end of the Klymaxx story were it not for infamous VH1 show Bands Reunited, on which it was revealed that two versions of Klymaxx were in existence - the official line-up and an alternate version created by guitarist Cheryl Cooley. Cue: fireworks. 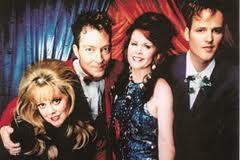 Unlike in many countries, The B-52's had already enjoyed a couple of big hits in Australia long before their explosion in 1989 with "Love Shack". Back in 1978, "Rock Lobster" reached number 3 here, while 1980's "Private Idaho" got to 11. Even so, the renewed success the band was enjoying in 1990 eclipsed anything that had come before. And, while it took me a number of years to be able to listen to "Love Shack" again after it was flogged to death from the summer of 1989 onwards, "Roam" never quite gained that level of ubiquity. It would be their last major hit in this country, but Kate Pierson's voice would be heard for the next couple of years on hits by R.E.M. and Iggy Pop. Despite my love for British music, I wasn't swept up by the Madchester craze that reached fever pitch in 1990 - with this track by not-actually-from-Manchester band The Charlatans rivalling The Stone Roses' "She Bangs The Drums" for my favourite from the scene. I also liked Inspiral Carpets' "This Is How It Feels" and "Sit Down" by James - but that was about it. This was also it as far as songs by The Charlatans I liked, although their Some Friendly album was only the beginning of a very successful career back home. Here's Bobby again, this time helping out the Hawaiian teen star (he was still 19 when this came out), who was in severe need of an image makeover. Glenn had shot to fame with mothers' favourite "Nothing's Gonna Change My Love For You", but with "She Ain't Worth It", he was aiming clearly at the youth market. It worked - with this track saving him from the dreaded one-hit wonder tag. I also liked "All I'm Missing Is You" (number 91 on this list), but it didn't do quite as well as "She Ain't Worth It", which would be his last major success around the world. Probably the last person anyone expected to hear from in 1990 was the king of the wild frontier himself, who hadn't released any music since 1985's disastrous Vive Le Rock. This lead single from the Manners & Physique album was a return to form, and deservedly found a place in the UK and US top 20. It was pretty much a last hurrah, although he'd pay one brief final visit to both countries' top 40 charts five years later with "Wonderful". In 2012, Adam again returned seemingly out of nowhere to tour Australia, but although I went to a lot of retro concerts last year, his wasn't one gig I attended. What ever happened to Margaret Urlich? Seriously. I can't recall her being heard of for over a decade. Over two decades ago, the New Zealand-born singer burst onto the Australian chart with this first single from Safety In Numbers, an album which would end up selling over 200,000 copies here. This was far and away her most successful song, although I also liked "Number One (Remember When We Danced All Night)" (number 69 on this list) and "Only My Heart Calling" (number 135). I was also a fan, although slightly less so, of her second album, Chameleon Dreams, which came out in 1992. 1992 was also the year "Escaping" was covered by British girl group Asia Blue, but it was a 1996 remake by Dina Carroll which finally turned the song into a UK hit. Here's another group that should have had more and bigger hits, with one of several great tracks lifted from These Here Are Crazy Times. Also taken from that album in 1990: "Talk About It" (number 92 on this list), which was given a new mix and featured on their remix album, Look! Listen!! - a release I always thought was a bit weird for a rock group. Nominally a double-A side release, "Dancing In The Storm" received all the attention, but "Mountain Of Strength" is also worth revisiting. On my weekly ARIA chart recap, I've talked about the lack of success many of Noiseworks singles had - something that rings true for this, my favouite song of theirs, which only reached number 26 nationally. After I'd enjoyed pretty much all their singles to that point, "Miles And Miles" was the only single I liked from third album Love Versus Money, an LP that included such travesties as "Hot Chilli Woman" and "Freedom". Before they became known as C+C Music Factory, producers and songwriters David Cole and Robert Clivillés were making a name for themselves thanks to their work with pop acts like Seduction (who have a number of songs on this list) and this male duo, who had more club than chart success. Their cover of Ambrosia's "You're The Only Woman" (number 68 on this list) was a bigger hit for Patrick Donovan and Ray-Ray Frazier, but I preferred this Clivillés & Cole original. I first became aware of TMBG in 1988 when "Don't Let's Start", their single from the previous year, popped up on an instore tape my sister nicked from her workplace. I liked the quirky and catchy melody, something that also appealed about their biggest chart hit (especially in the UK, where it went top 10), "Birdhouse In Your Soul". TMBG are also one of many bands whose greatest hits collection I own for only a handful of songs (basically the two I've mentioned and Malcolm In The Middle theme "Boss Of Me") - although I'm sure I'd find more to like if I tried harder. One-hit wonder alert. Even a bizarre hair cut and weird nose ring/chain combo couldn't distract from the fact that Jane only had one good song - but what a great tune "Don't Wanna Fall In Love" is. Even Pussycat Dolls agree - having recorded their own thinly voiced version (for one of those bonus tracks where someone other than Nicole got a chance to sing). On Thursday, it's back to 1988 for my ARIA chart recap, then I'll continue my 1990 countdown with Part 3, which will include some of the biggest British dance hits of the year and the arrival of one of the most successful female solo artists of all time.